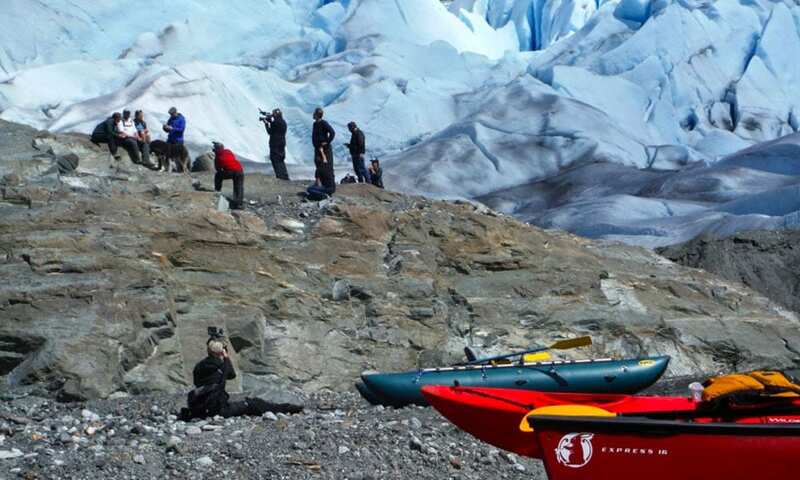 The Mendenhall Glacier Paddle and Trek experience is a favorite among Juneau glacier tours and an experience you’ll be unlikely to forget! Imagine paddling a canoe over the tranquil waters of a serene glacial lake, with the grand peaks of snow-capped mountains and cascading Nugget Falls reflected in the surface; skimming around glowing blue icebergs; and marveling at the region’s diverse wildlife, from gulls and terns nesting along cliffs to mountain goats, porcupines, river otters, beavers, bald eagles, black bears, and other inhabitants of this magical landscape. At the edge of the awe-inspiring Mendenhall Glacier, the adventure continues as paddles are traded for trekking poles and your guide takes you right onto the ice for a two-hour trek, which sometimes even includes the opportunity to explore other-worldly ice caves! With the glacier only twelve miles from Juneau, the Mendenhall Glacier Paddle and Trek adventure is conveniently situated near the historic port town. 2017, though, is only the second year in which guests have been permitted to venture across Mendenhall Lake and right onto the glacier itself, so don’t miss this still-exclusive opportunity! If conditions are judged by the guides to be sufficiently safe and ice caves have formed, your trek across the massive 13.6-mile-long river of ice will feature a cave journey into the glacier itself! With a maximum group size of just 12 participants, this intimate favorite among Juneau glacier tours allows plenty of time to question your knowledgeable guides and learn more about all you are seeing and experiencing. Your excursion is followed by a leisurely paddle back to your retrieval point by the lake’s edge. Pick-up and return from the cruise docks, as well as from many Juneau hotels, is included in this stunning, family-friendly 6 ½-hour experience. Join us on this top tour, because after all, no visit to Juneau is complete without a close-up experience of the legendary Mendenhall Glacier! 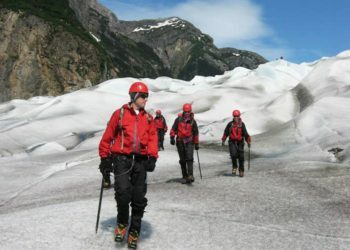 To explore Mendenhall Glacier without the paddling portion of the tour, consider the Mendenhall Glacier Trek. The minimum age for participants is 12 years old. Must be fit enough to paddle for 5 miles and be able to sit in a canoe for up to 3 hours. Answer: Because much of SE Alaska is a rainforest, these trips do operate rain or shine. Rain jackets and pants are provided on this trip. If weather conditions are unsafe, the trip will be canceled and we will provide a full refund. This can happen on canoe trips from time to time and will be typically related to sea or lake conditions, not rain. Answer: You'll have a chance at the kayak base to use the restroom but after that we will be entering the great outdoors. We recommend all guests follow 'Leave No Trace Principles' and should the need arise, we request packing all trash from the trip including toilet paper. If this is of concern for you, we recommend bringing toilet paper and a ziploc bag for easy packing. How many guests can attend on this tour?